Credit to Rodrigo Santos for the majority this article. It was written with regards to car racing, but the interface between the tire and road surface is the same, even if the effects of the sidewalls are increased. There is just no better way to start a discussion on vehicle dynamics than beginning by with the tires. Those small rubber components are the only contact the car has with the track, and the only way the driver has to ensure the car is following the intended direction. To begin with, lets talk about the most important characteristic: the generation of lateral force. First, let us make some things clear. The force generated between the tyre and the track is not friction in its strict sense. The traditional Coulomb friction theory says that friction is proportional to vertical load on a body, independently of the contact area. This model is good for a great range of physics and engineering applications, but this is not the case for tires. The generation of lateral force (which only exists because of “friction” between the tire and road) of tires is strongly dependent on vertical load, but also on tire width, size and pressure, which clearly are related to the contact area between tire tread and the road. With that said, I will use the terms “friction” or “grip” referring to the force that arises in the interface of the tire with the track, since this is the term used in most of the literature on the matter. 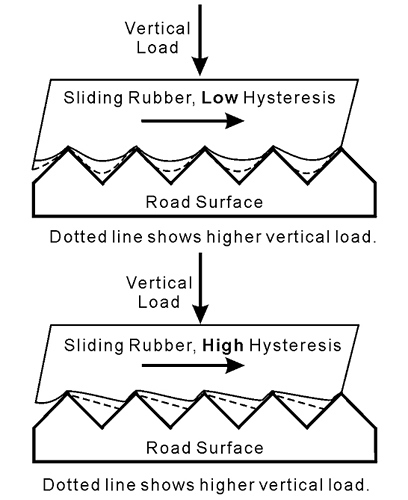 The forces generated on tyre-track interface arise mainly due to two mechanisms: adhesion and hysteresis. The adhesion rises from the intermolecular bond between the tire rubber and the aggregate in the track surface. It is the larger of the components on a dry track surface, but it is significantly reduced under wet track conditions, hence the grip reduction on raining conditions. To explain how hysteresis gives rises to grip between the tire and the track, I will first clarify what hysteresis is. In terms of tires, hysteresis is the tendency of the rubber to have a delayed return to the natural state after suffering a deformation. Confusing? A little bit. Let’s make things a little bit clearer: if you press your fingernail against a “hard” low hysteresis kart tire’s tread, the rubber will return quickly to its natural state. Do the same with a “soft” high hysteresis tire and the mark will stay there for a few seconds, returning much slower. “Consider Fig […] where there is some sliding between the rubber and an irregular surface. If the rubber recovers slowly from passing the irregularity as in the high-hysteresis rubber, it can’t push on the downstream surfaces of the irregularities as hard as it pushes on the upstream surfaces. This pressure difference between the upstream and downstream faces of the irregularity results in friction forces even when the surfaces are lubricated.” The mechanism in question is shown in Figure 1, originally taken from Haney’s Book. When the driver turns the steering wheel, the kart initiates negotiating the corner. Shortly after this happens, the inertia of the kart generates a centrifugal force or inertial force that pushes the kart outside the corner. This force is also transmitted to the tires, causing a lateral deflection on them. Figure 2 illustrates how the tire will look like after deformed. FIGURE 2. Tyre in upright zero slip condition (left); Tyre deflected after lateral deflection caused by inertial forces (right). You can see this effect in many karting videos showing tires deflect in corners. The lateral deflection happens for two reasons: first, the tire is elastic in twist, i.e. the part of the tire that is in contact with the road (called contact patch) will not rotate as much as the rest of the tire (by rotation, I mean the steering rotation of the wheels, about the vertical axis). Since the tire is elastic, the points in the tire near the contact patch will also have a lateral deflection. Once the tire is rolling, the area of the tire that will be part of the contact patch will be constantly renewed, experiencing side deflection when passing through the contact patch leading edge, its center and its trailing edge. On the other hand, the areas of the tire are attached to each other, and because of that, the deformation begins before the area of the tire reaches the leading edge of the contact patch, and ends after the rubber goes past the contact patch. Figure 3 shows the deformation taking place before, during and after the particle touches the track. FIGURE 3. 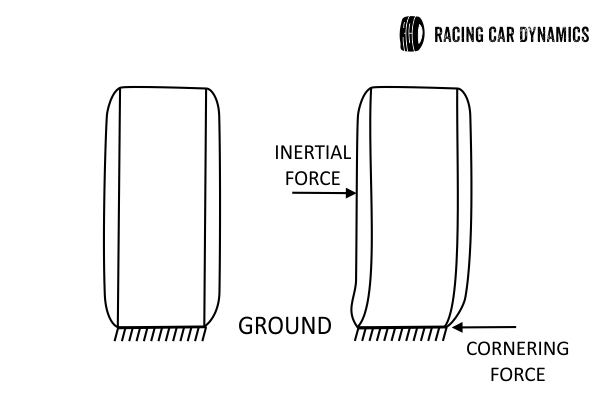 Lateral deflection in tyre contact patch and its vicinities. (CLARK, Samuel; 1971, Mechanics of Pneumatic Tires). The second reason why lateral deflection happens is because the grip between the tire and the track prevents the tire from sliding sideways when the inertial force pushing the tire towards the outside of the corner is present. This combination of effects makes the tire travel in a different direction from that the wheels are pointing. Think of it as the following example: if you walk straight ahead, but with each step you move your feet a few inches to the side, the path that your feet will make is going to be at an angle with the direction you are facing. The same happens with the area of the tire in the contact patch. The angle between the tire path and the wheel pointing direction is called Slip Angle and it is of fundamental importance for the knowledge of how any performance vehicle (karts included) works during a corner. It is important to notice that no sliding is occurring between the tire and the track, which makes the term “slip angle” somewhat of a misnomer. However, this is the name used in most of (probably in all) the literature on tires, vehicle dynamics and race car dynamics and will be used here as well. The video below shows an experiment in a tire test rig where is easy to see the slip angle. The lateral deflection taking place in the tires gives rise to an elastic force. This force, called cornering force or lateral force is perpendicular to the direction the wheel is pointing and happens in the center of the tire contact patch. The relation between lateral force and slip angle is reciprocal: The lateral force can be thought as a result of the slip angle, and the slip angle as a result of lateral force (if the lateral force is increased, the centrifugal force will also increase, generating larger deflections on the tire, and hence, larger slip angles). Cornering force can be thought as the capacity of the tire to resist sliding sideways when in a corner. The lateral force will increase with slip angle, and both will grow by decreasing the turn radius or increasing the vehicle’s linear speed (both of these conditions represent a growth in lateral acceleration). As the slip angle increases, some sliding begins to occur in the tire tread. If the slip angle is further augmented, eventually the tire will “break loose” and sliding will occur in the entire contact patch. The three ranges of tire behavior in a corner, namely, no sliding, some sliding and total sliding in the contact patch are called, elastic, transitional and frictional ranges of tyre operation, respectively. When in the frictional range, the sliding friction between the tyre and the track is the only cornering force present, and is no longer caused by tread distortion. Figure 4 shows the relation between lateral force and slip angle in a graph, where it is possible to see the three operational ranges. The slope of the of the curve on the linear (elastic) range is called the cornering stiffness of the tire, and it is an important parameter for the analysis of cornering behavior of the kart. The equation below shows the mathematical relation between the lateral force generated by the tire (Fy), the slip angle (alpha) and cornering stiffness (C ) of the tire. The peak of the curve will determine how much lateral force a tire can produce. This force is called the limit of adhesion. After reaching this limit, the lateral force will decrease, and this will be transmitted to the driver as a light feeling on the steering wheel, indicating that the limit of adhesion has been surpassed. The shape of the curve determines how the car will behave in high acceleration and grip limit situation. For example, take a look at figure 5 below. If the curve has a sharp top, it indicates an abrupt change from transition into a skid, with little warning to the driver. Curves with almost flat top indicate a smoother transition, giving much more warning about the grip situation on the tires. Unfortunately, the tires with higher lateral force capabilities (i. e. “soft” tires) are the ones with more abrupt transition from grip to skid, and so, the racing driver has to learn how to read that from his steering system. When looking at Figure 5, one can think of the high performance tire as a “soft” kart tire (MG Yellow) the lower performance tire as a “medium” kart tire (MG Red) and the street tire as “hard” kart tire (a Cheng Shin or similar rental kart tires). FIGURE 5. 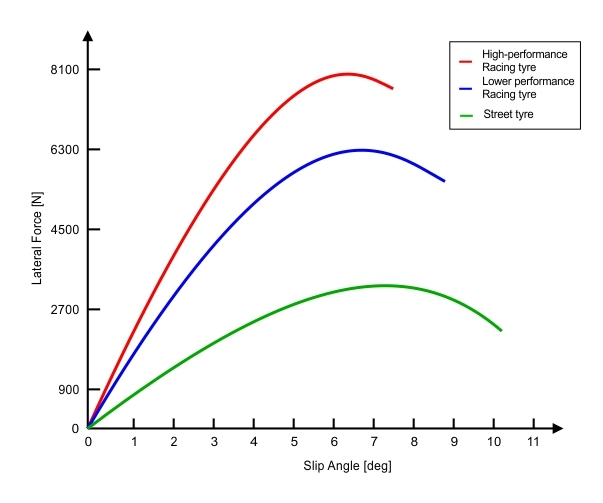 Lateral Force vs Slip Angle for three different tyres (the curve is plotted with arbitrary maximum force values, just to show what the line shape should look like). An interesting fact about tires operating at a large slip angle, is that they have a significant resistance to forward motion, and this resistance grows with slip angle. Thus, if power is not applied during such situation, the race car will decelerate, much like hitting the brakes. The technique of using high slip angles to decelerate the car is known as scrubbing off speed. This allows the driver to slow down without actually using the brakes, by throwing the kart very hard in a corner, generating high slip angles (braaaaap). Where LFC is the lateral force coefficient, Fy is the lateral force and Fz is the vertical load on the tire. Now, if a tire is tested to obtain the lateral force vs slip angle curve with several vertical loads, the result is somewhat as in figure 6. If, instead of plotting lateral force we plotted lateral force coefficient (normalized lateral force), the results would be as shown in figure 7. This graph can provide a lot of information. 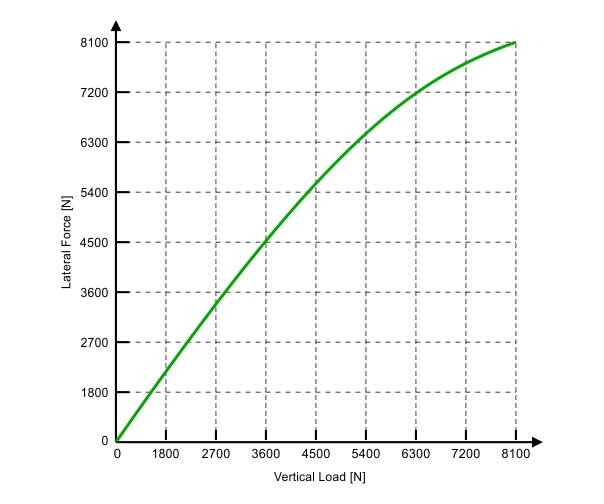 As you can see, the lateral force coefficient actually decreases by increasing vertical load. 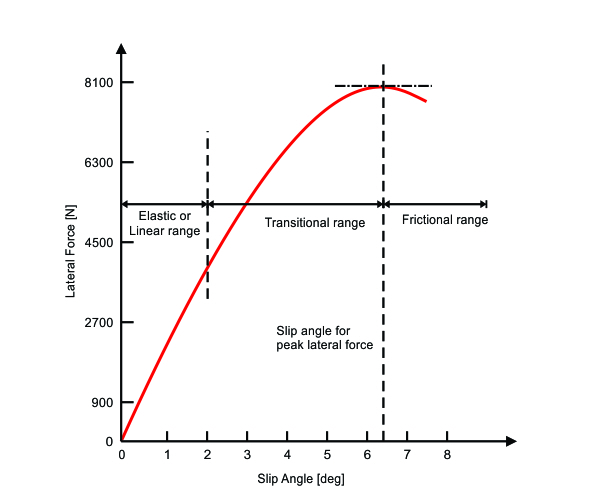 On the other hand, cornering stiffness grows (slope of linear range on figure 6) with higher vertical forces. By comparing figures 6 and 7 we can see that the ratio Fy/Fz decreases, but the lateral force continues to increase, as vertical load is augmented. The overall outcome is lateral force increasing at a smaller rate at higher vertical loads, and that results in a nonlinear relation between vertical load and lateral force as shown in figure 8. FIGURE 8. 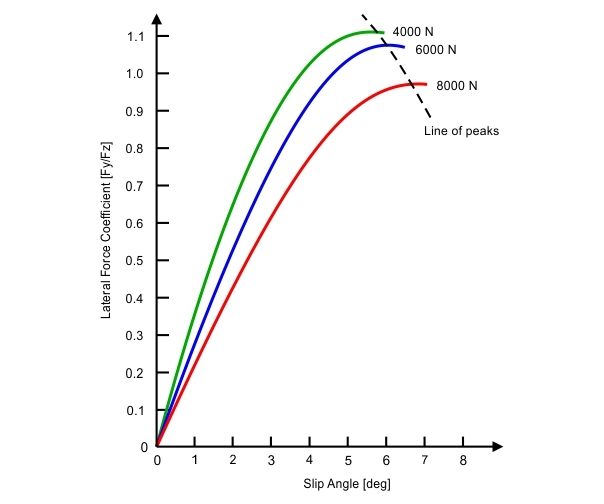 Lateral force vs vertical load for a single slip angle value. From analyzing figure 8, it is possible to get important conclusions on the behaviour of a pair of tires acting parallel to each other, as in the front or rear axles. Under lateral accelerations, there will be a load transfer on the axle from the inside tire to the outside one. The overall vertical load on the axle will remain the same, yet the total lateral force generated by the axle will be smaller than if no lateral load transfer had occurred. Complicated? Then let’s take the example in figure 8 to understand better what happened. Let’s say a formula car has a 367 kgf (about 3600 N) weight on each of the rear tires. The theoretical lateral force generation that we could obtain from a single tire looking at figure 8 is about 4500 N, and hence the lateral force capability of the axle would be 9000 N. If we have a 50% lateral load transfer on the rear, then the outside wheel would have a load of 367 + (0.5 x 367) = 550.5 kgf (about 5400 N), while the inside wheel would end up with only 183.5 kgf (about 1800 N) of vertical load. 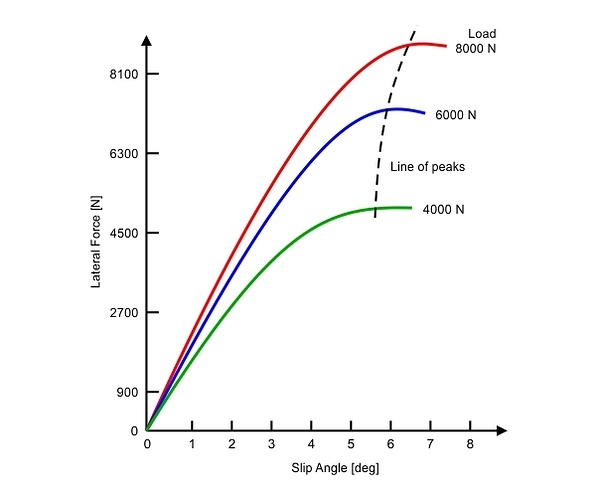 By looking at figure 8 again, it is possible to see that total lateral force that could be generated by the outside tire under these conditions would be about 6500 N, while the inside tire would generate only 2200 N. The total lateral force generated would then be 8700 N, and we would have lost lateral force capability. The curve here is arbitrary, and so are the values, but the general behavior of the tire regarding vertical load holds true. This behavior of an axle under lateral load transfer is crucial for the karts handling. Dude, you’re a monster. What a post! THANK YOU! This article gave me a bad case of hysteresis. Damn, I just tune for <2psi increase and let her rip. Joking aside though, that’s a monster to a topic that I’ll have to come back and digest later. One thing I learned recently (last few years) that I think is interesting is that a wider tire/rim doesn’t change the size of the contact patch, only the shape. Given same inflation pressure of course. Just don’t wear your new suit while your dealing with that! I couldn’t work out how to only put a bit of the kart tire video up. i only wanted the first 20 seconds. Perhaps he and the pit boss had a baby and thus his karting days are, for now, over? I will post a pic next track day so the other forum members can see how pretty the suits you guys make are. Reviving an old thread, with regard to soft/medium/hard tires does changing compounds have the same effect as different stages of track rubbering? So I was thinking if the series I drive uses Vega whites, could I throw on a set of Vega Yellows to simulate during a plain practice/testing day, what a track would be like during a competition (or series=green, try whites etc)? Conversely could I use Vega greens to simulate a track with less grip than it currently has? Does using softer tires allow more grip to be dialed into the kart using chassis adjustments before hopping occurs? You can certainly try to replicate a greener track by using a harder compound. It won’t be a perfect simulation but it could definitely give you an idea of what the kart is going to do with less grip on-track. Using a softer tire is going to allow LESS grip to be dialed into the kart before hopping occurs. For example, I ran the MG Red in KA100 last year, and just ran X30 on MG Yellows this past weekend for the first time in a few years, so it was a good refresher on the differences between the tires. The Yellow (softer) has a smaller window in terms of getting the tire to the limit. In my first two sessions I was struggling to get to that limit without going over or under. On the Red (harder) you can over or under-drive a little without as much of a penalty. On the Yellow it just takes a small amount of over-driving to get the kart to start hopping, or a small amount of under-driving to drop the inside rear and have the kart sit flat. That being said, your setup on a harder tire should be pretty close to your setup on a softer tire in terms of balance. You might find you need to free the kart up a little more on a soft tire or dial in a little grip on a harder tire to consistently be at the tire’s limit, but the balance should remain similar, unless there is a big difference in tire construction or sidewall between two compounds.